This Illustrated Map Of London by artist and illustrator Alice Tait caught my eye when it popped into my inbox, I think it would make a fab Christmas gift for someone. The map contains sketches of some of London’s best-known landmarks and attractions, including Notting Hill, Hyde Park, The Royal Albert Hall, London Zoo, Buckingham Palace, The London Eye, Saint Paul’s Cathedral, The Tower of London, The Gherkin and Brick Lane, as well as the River Thames. The picture is litho printed on thick watercolour style A3 paper (42cm X 29.7cm) and is supplied unframed. The print will be hand signed by Alice herself, and if you wish you can request for it to be personalised. 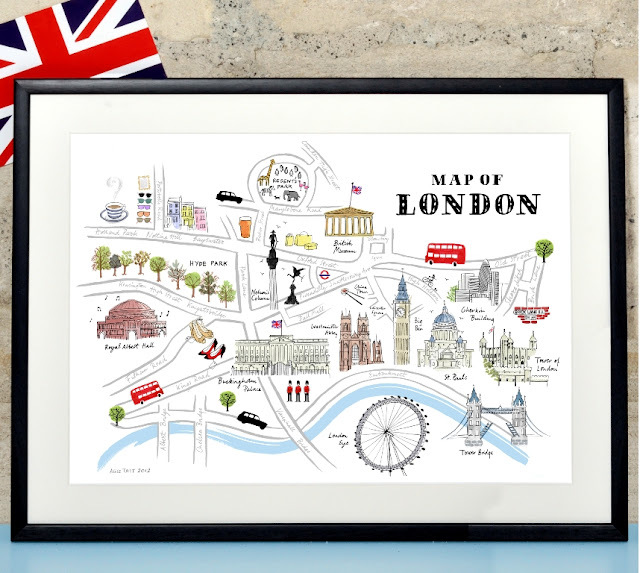 This would make such a nice gift for a friend or family member who loved London, I have a few that love to visit at least once a year!